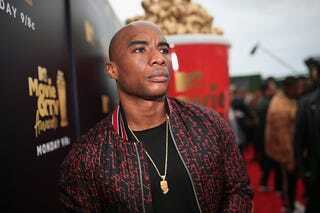 Charlamagne tha God attends the 2018 MTV Movie and TV Awards at Barker Hangar on June 16, 2018, in Santa Monica, Calif.
Charlamagne tha God is bringing his controversial questions and topics to HBO. According to Deadline, HBO has ordered The Gray Area With Charlamagne tha God. The series will include four interview specials to premiere later this year. Not much has been shared about the series, including the interviewees, but the hourlong specials will surely grab viewers’ attention. Charlamagne always has to add his two cents when guests appear on iHeartRadio’s The Breakfast Club, sometimes barely allowing them to speak. I wonder if he’ll have this much freedom on HBO. As for TV experience, he’s been on MTV’s Guy Court, Girl Code and Uncommon Sense—none of which anyone is really checking for, but perhaps this new special will draw in viewers. Who would you all like to see him interview? He’s already talked to everyone from Terry Cruz to Sen. Kamala Harris (D-Calif.). Montana Couser is a recent Howard University grad and Philly native.